Science Museum Science Putty - Orange. 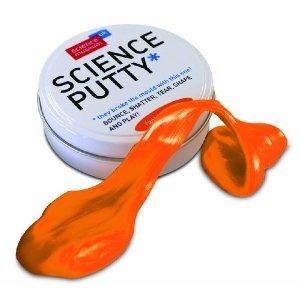 Science Putty may be a crazy invention but it is guaranteed you will love it! Bounce it, tear it, shape it, stretch it... This silicone based blob will have you entertained for hours! And here's a tip for you, put it in the freezer for an hour or two and its 'bounce-ability' will improve! A fantastic subject for any science project, why not see how your Space Putty reacts to different temperatures? If you stick it from a fridge or filing cabinet for a few days it may even start running like a blob of cosmic jam. Space Putty makes a fantastic gift and can cure boredom at school or work in a second. Science Putty can be shaped, pulled, bounced and more! If you're always faffing around with Blue Tac at your desk? Go one giant leap further with Science Putty.